When I first came to Stockholm and told people I would be staying in a hostel they were amazed that I would share a bathroom and or bedroom. The last time I stayed in a hostel was 40 years ago when I was 19 and traveling in Europe. The M/S Birger Jarl is not your grandfather’s hostel or hotel. The hotel manager is my Swedish BFF, Bitte Norlen, and we chatted over the buffet breakfast. She has been following me and Arise 2.0 particularly the FaceBook lives. Bitte was surprised I didn’t have a selfie stick. I do, I just didn’t have it at breakfast. Bitte has been in the hospitality/restaurant/hotel/service business for years, but only at this site for months. We share a lot in common including the same first birth name, Elizabeth. Turns out I am staying in the hotel not the hostel. I have a private bedroom and bathroom in my cabin, also desk and sitting area with two chairs. It was a former cruise ship built in 1953 in service between Stockholm and Mariehamn. There are 177 cabins for rental and 6 decks. In 2013 it ceased being a cruise ship and turned into a floating hotel and hostel. 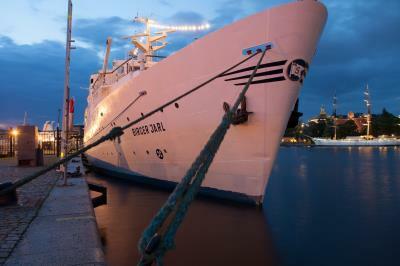 It’s docked near the Birka Cruises on Stadsgarden near the Slussen Metro and walking distance from Gamla Stan, Old Town. Birger Jarl aka Birger Magnsson was born in 1210 and died in 1266. It received “K Mark” status as culturally important from the Swedish Maritime Museum for the beautiful original wooden interior. The original plan was to have it completed for the 1952 Helsinki Summer Olympics. When I was here in October I went out on a Sunday three hour cruise that fortunately did not result in Gilligan’s Island status with the fictional S/S Minnow. It leaves berth 80 times annually for two hour cruises. There is wi fi and television in the common areas and also a Skybar in the summer and a Cocktail bar , “piano” bar and restaurants year round. I will going Facebook Live for the Christmas table, a Swedish thing during the cruise. Peace, love, gratitude, compassion and blessings. Previous How can I Make the World a Better Place? Next #BlackinScandinavia: Where is home?